Summer is officially in! As the kids and I are getting used to our new schedule, I also started a new routine – just for me. Every night, usually an hour or two after dinner, I would enjoy a big cup of my favorite tea and read at least three chapters of a book from my reading list. For some, the new night routine is not much but for me, it made a big difference. Not only does it helped me calm down, it inspires me to accomplish more the next day. Are you a tea drinker? I’m a big fan. Over the years, I have learned that there is a tea for every mood and need. A cup of tea can soothe any pain, relax or energize and even improve our emotions. With the different uses and benefits of drinking tea, I admit I’ve already built a quite a collection. One of the biggest challenges I encountered when building my tea collection is the big quantity of tea I’m required to purchase. Since tea is one of those items that we can’t really try before buying, there were times when I ended up throwing away a bunch when I didn’t like the taste or they went bad. Then I was introduced to Enjoying Tea Sampler Kits. Each sampler kit contains 6-8 different types of tea. Depending on the size of the leaves, you will get between 0.5 oz and 1.5 oz per variety. That’s good for at least 3 cups of tea. Each type of tea comes in its own square tin canister which is housed in a beautiful box. 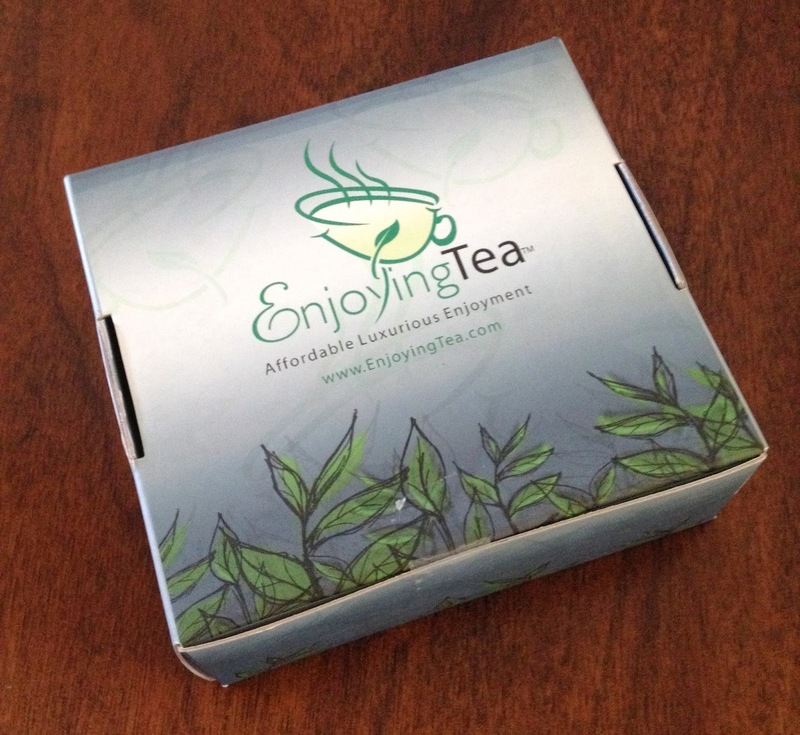 Prices start at $13.98 and varies depending on the type of teas included. Jasmine Green Tea – Mild and refreshing, this green tea isn’t bitter at all. I like it with some lemon juice for a cleansing effect. Keemun Black Tea – Considered the finest of all black tea, Keemun is a nice treat to enjoy anytime of the day. I enjoy it full strength or with a splash of milk. Roasted Mate Chai – My favorite! Usually, I often make my own chai from the recipe I learned from an Indian friend. The spice mix in this tea is really good. Quite rare for ready made mixes. Earl Grey Black Tea – Earl Grey is one of the more common teas readily available in the market. Depending on the brand you get, it’s taste can be subtle to none. This one however, is loaded with flavor and is not too bitter. The orange notes really come out during brewing. 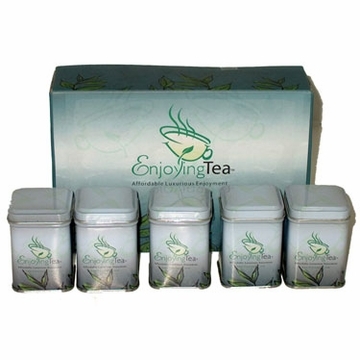 Organic Slimming Oolong Tea – This has a smooth, nutty flavor and also great for iced tea. About the slimming claims, I’m not sure because I only tried it once and I haven’t noticed any changes yet. Fingers crossed! Vanilla Rooibos Tea – Caffeine free with nice hint of vanilla & almond, it’s great to as an after dinner dessert tea. Did I entice you to start trying different flavors of teas? Well, I worry, the generous people from Enjoying Tea is happy to give a Sampler Pack to one lucky TFMFriend here in the US. Simply follow the steps below to get some entries. No purchase necessary to join. This giveaway will end on July 10, 2015 11:59 pm EST. This giveaway has ended. Congratulations to the winner – Untung M.
My favorite tea is a tea that is fruit flavored. I love peach and watermelon the most. My favorite kind tea is the Black Tea. Black Tea always helps me relax. Green tea with honey for sure! I love all the teas! it is so hard just to pick one! My favorite has always been green tea with lemon. That's my feel good tea. It's great for sore throat too. My favorite tea is Chai. I start my day with a hot cup. My favorite tea is oolong. Do you take it with milk or cream? My favorite is Chai. I like to brew it the traditional way, then ice it. I even have the recipe for my iced chai on my blog so I can share it with my readers. My favorite tea is chai. I brew it the traditional way, then ice it. I even have a recipe on my blog for my iced chai. YUM! my favorite tea is green tea. refreshing and calming when I drink it at night, and energizing when I drink it in the morning.